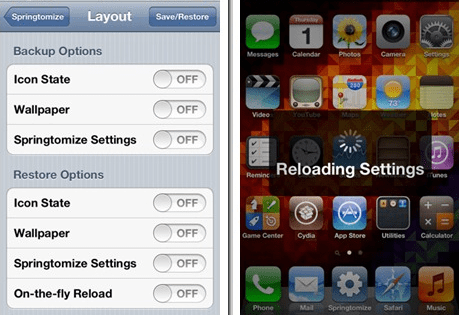 If your device already has iOS Jailbreak evasi0n's hand, then you can not have a look at one of the most acclaimed packages Cydia: Springtomize 2, which has been updated with support for the iPhone 5. This is one of the tweaks that offers more features and now comes with all new screen adaptation for the iPhone 5. Springtomize allows us to fully customize our SpringBoard, to make it look like you want. If you already have Springtomize 2 on your device, you will see the update available via Cydia. Version 1.4.1-1 also offers fixes to problems that appeared in the previous update (as failure status bar and safe mode). The medium iDownloadBlog reports that while the update looks like never in the iPhone 5, the status bar still experience some problems. For example, it seems that there are still problems with the personalization of the name of the operator. If you want to modify even the smallest detail of your iPhone, Springtomize is the right choice, despite these minor flaws that will likely be fixed in future updates. You can find Springtomize 2 via BigBoss repository in Cydia for a price of $ 2.99. Article Springtomize 2 has been updated with support for the iPhone 5 has been originally published in News iPhone .